Is it the SRAM or the decoder mux? I didn’t get a chance to play with any hardware today, but I want to elaborate on the conclusion I came to previously. In my last post, after several diagnostics of the Tandy logic board, I concluded that the problem was a failed SRAM chip, specifically M6 – the “option” RAM. I still think this is the most likely culprit, but there is one other possibility: a bad decoder mux – M5 . 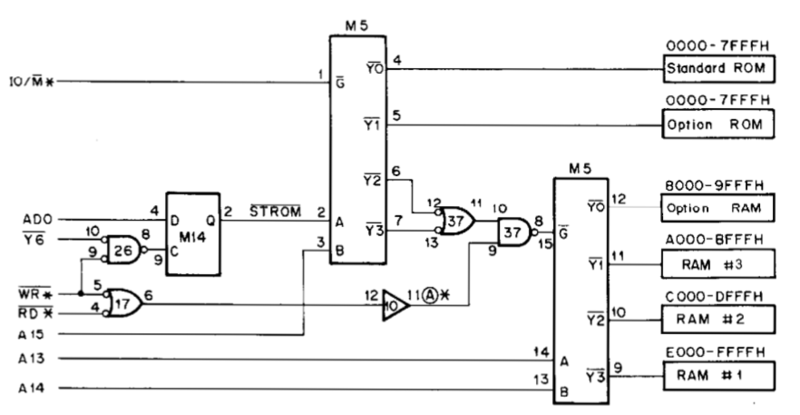 The Tandy 102 Technical Reference Manual describes the decoder circuit in great detail and provides the schematic. The decoder circuit uses a multiplexer (mux) to convert the top three bits of the address bus into individual chip enable signals. (Actually, the tech ref talks about generating eight enable signals for an earlier version of the 102 which used 4k SRAM chips.) 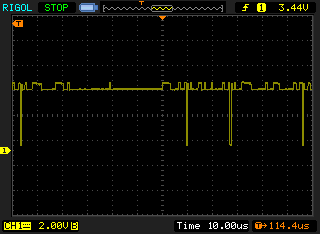 I can see from the oscilloscope output that no chip enable signal is getting to the option RAM’s enable pin. I find it unlikely that the mux (M5) would fail only on a single output pin and leave the others working (which they must be if the rest of the RAM works). Generally speaking, it’s more likely that a large-scale-integrated chip (like an SRAM) would fail versus a small-scale-integrated one like a mux. The enable line on the working chip shows a small amount of digital noise, where the presumably failed on does not. What could this mean? I’m not completely certain, but I expect that the noise is coming from within the inner workings of the SRAM and is bleeding into the enable line – not enough to affect the line, but present nonetheless. The non-working chip shows clean Vcc. No digital noise could be a sign that nothing is going on inside the chip. So, that’s the reasoning behind my conclusion. Hopefully I’ll be able to break out the soldering iron soon and test my theory. Here it is – taunting me! That horrible number: 21446 Bytes free. The Intel 8085 (an 8080 derivative) has a 16-bit address space, meaning it can address up to 64k of physical memory space. 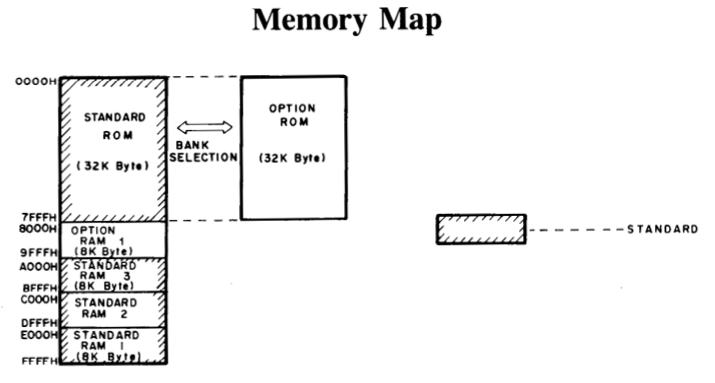 The system ROM occupies the top (lowest-address) 32k of memory space and the SRAMs occupy the bottom (highest-address) space. The space in the middle, between 8000 and 9FFF, is a little bit special: it’s reserved for the “Option RAM”. When the Tandy 10o was originally introduced, it shipped with only 8k of RAM installed, but had sockets for up to 24k of additional RAM. When the 102 was later released, being an upgrade of the 100, it shipped with 24k installed and left a single space open for an additional 8k of RAM: the “Option” RAM. Together all four 8k RAM chips provide the full 32k of RAM from address FFFF to 8000. 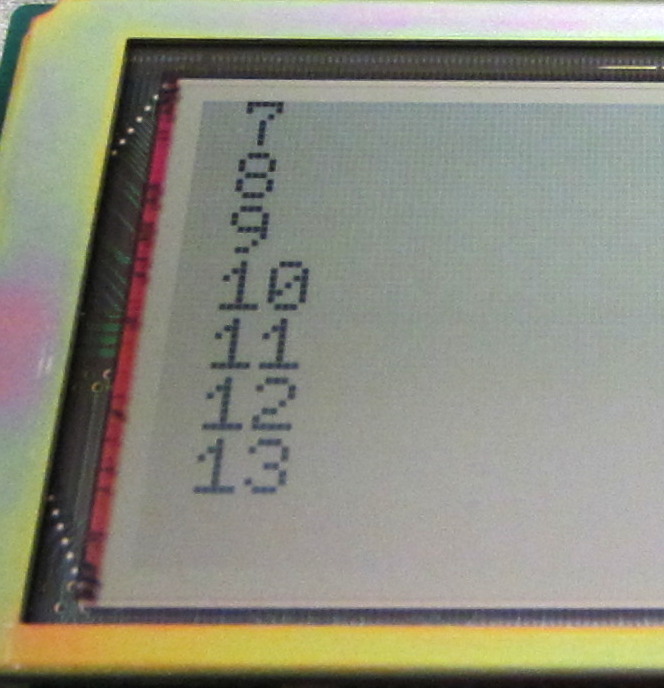 (Note that all of these RAM address numbers are given in hexadecimal notation.) 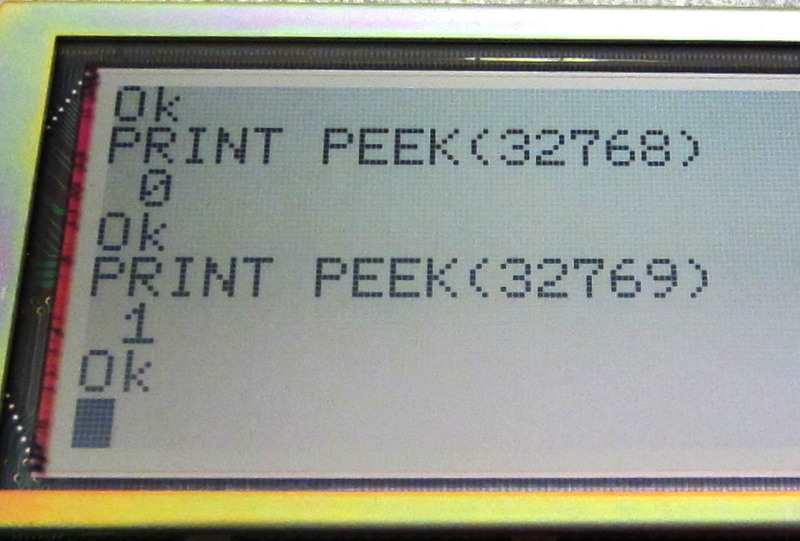 However, as the Tandy 100 OS and various other memory structures occupy some memory even on a freshly booted system, a 32k Tandy 100 will show 29314 bytes free. The sad 21446 in the bottom-right corner of my unit is the max free space on a 24k system, meaning that it has lost 8k of RAM – a full quarter of its precious memory. 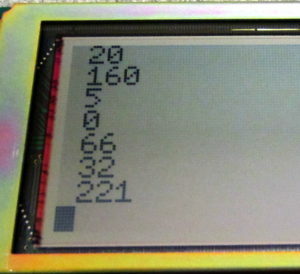 The answer lies in the 80C85’s multiplexed data bus. The lower 8 bits (the least-significant bits) of the address bus are shared with the data bus. So, when accessing memory address 8000, the bottom 8 bits of the address bus are all zero. Then, after the address has been sent to the RAM chips and latched by the memory decoding circuit, the 80C05 reads the data lines; the RAM chip should have loaded an 8-bit data word onto these lines by now. However, if we have a faulty RAM chip, what’s left on the data bus is the lower byte of the address we read. 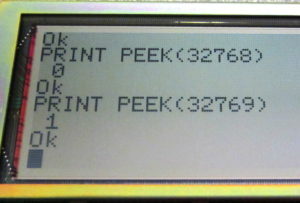 Hence, as we increment the read address, the value we get from the PEEK also increments. 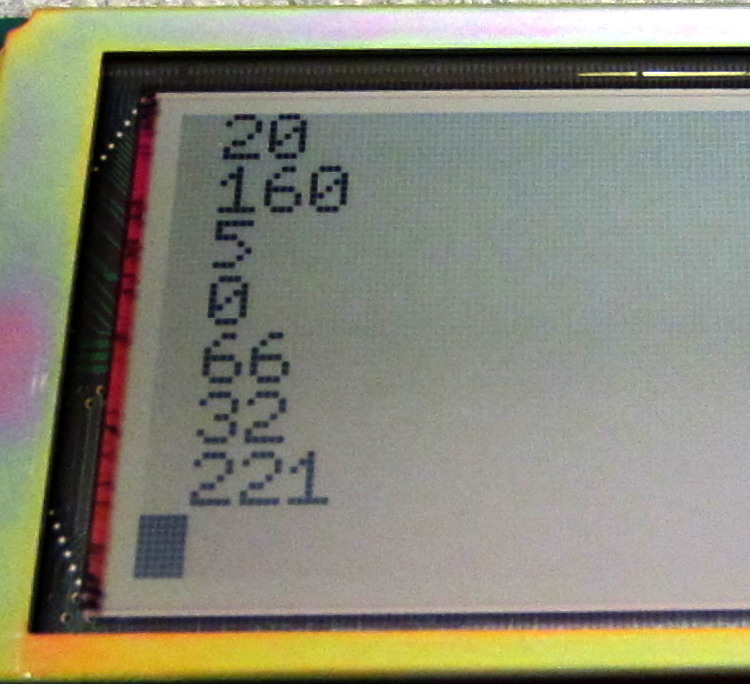 Random values – exactly what we would expect when reading from a random address inside a working RAM chip. So, what’s wrong? The Tandy 102 technical reference manuals (remember when you could get those?) lays out the memory decoding circuit. A multiplexer is used to turn top three bits of the address bus into individual chip enable signals for the 4 RAM chips. With this circuit, even though all four chips are receiving the same address on the bus, only one of them is active at any time. So, if I probe the chip enable lines, I should be able to see the decoder circuit activating the right chip at the right time. Probing RAM chip M7 (the one we saw giving the expected random bytes earlier), we see the enable line periodically going low (this is a low-active line, meaning the chip is enabled when the line goes to ground). 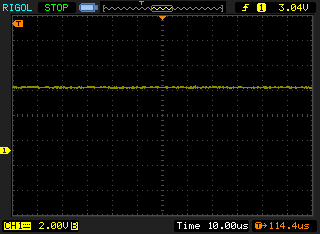 However, when probing M6 (the option RAM) chip enable, the line never goes low. In fact, we don’t even see the small amount of digital noise present on M7’s chip enable line. I was hoping to find a bad trace here, but checking from the decoder mulitplexer to the M6 chip enable line shows zero ohms: an intact trace. So, faced with these facts I must conclude that I have a dead RAM chip. Luckily, 8k x 8 (8 thousand “words” by 8 bits) SRAM chips are still readily available. 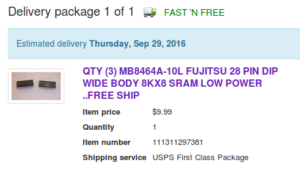 A quick check on ebay brings up a 3-pack for $10 with free shipping. If only we’d had RAM prices like that in the ’80s! Welcome to the 8-bit computer hospital. Patent number one is a 28-year-old 32kB Tandy 102 suffering from acute amnesia. Patent reports being in the middle of some casual BASIC coding when it suddenly crashed and erased the program. Upon cold-boot, it couldn’t remember anything from its upper 8k of RAM. In fact, the patient insists that it only ever had 24kB. When asked, under hypnosis, to recall anything from 8000 to 9FFF, it simply repeats the question. The Tandy 102 has undergone oscilloscopic imaging to determine the extent of memory damage. It appears that chip M6 has failed, leaving the patient one quarter of its RAM dead. Patient number two is a 33-year-old Atari 400. This Atari has previously received several elective procedures, including a RAM augmentation, an RF-ectomy, and a keyboard graft. Patient is here to correct a previous composite video surgery that left it with poor luminance. While on the operating table, patient has also elected to receive a stereo pokey implant. Goody! My Tandy SRAM should be here just in time for Retrochallenge.